"The flight of the 'Enola Gay' and the capture of the island of Iwo Jima were two of the most significant events of World War II. I wanted, in some small way, to pay tribute to those who captured that island fortress even as I paid homage to the United States Army Air Forces and the crew of the 'Enola Gay' for the mission. Both events hastened the end of the war and made the invasion of the Japanese homeland unnecessary." Crewmembers with Colonel Paul Tibbets completed several missions against Nazis in Germany before participating in the invasion of North Africa. A third, dramatic change occurred when Tibbets was named leader of the 509th Composite Group. He and an elite crew transitioned from the B-17 Flying Fortress to the largest aircraft flown during World War II, the B-29 Superfortress. The transition was cloaked in secrecy. The aircraft itself was designed to specifications calling for a bomber capable of flying 5,000 miles, at 400 mph and carrying 20,000 pounds in bombs. The requirements were extraordinary in the late 1930s. In 1934, Boeing engineers designed the Model 299 that became the XB-15 and the B-17. By 1936, Boeing engineers worked on an updated XB-15, Models 330 through 334A. It wasn’t until 1939 that Model 341 came along with an improved wing. By then war drums were sounding across the Atlantic. Soon after, analysis of enemy bombers was possible and reaction to the findings pressed Boeing to follow the B-17 with a strengthened bomber that would be long-range and equipped with more, and higher caliber, machine guns and self-sealing fuel tanks. Sharing Billy Mitchell’s vision of airpower’s destiny, General H.H. “Hap” Arnold exhibited a bulldog’s tenacity to implement the bomber. The United States Army Accessions Command (USAAC) was so desperate for this aircraft to fulfill the specs that the XB-29 was ordered in massive quantity before the prototype flew. It boasted innovations—an advanced gunnery system and pressurization—but it had difficulties from the start. Development was arduous. The first planes arrived in India in April 1944, and missions were plagued with engine failures, aborted takeoffs, and poor results. Logistics was a nightmare. 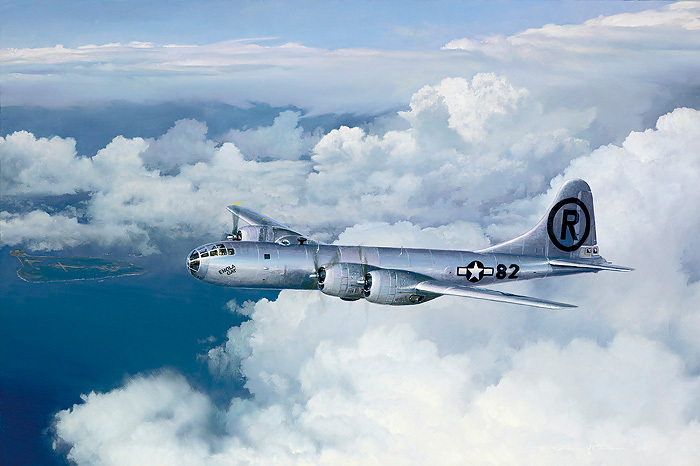 Nevertheless, by March 9-10, 1945, 302 B-29s flew the first raid against Tokyo. By April 12, Japan’s aircraft engine industry was virtually gone. Surrender was no option for Japan, but Enola Gay and Bock’s Car forced the issue. The Boeing B-29 Superfortress was a major contributor to Japan’s defeat.